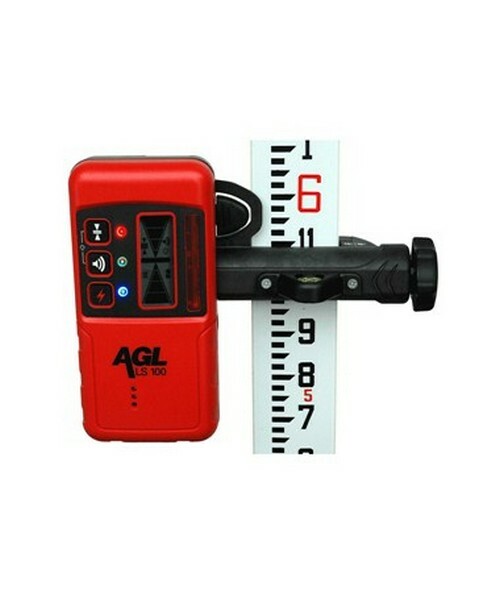 The AGL LS-100 laser receiver easily picks up the signal of your red beam rotary laser outdoors. It features dual LCDs, large laser beam detection window and audio output for instant visual grade information. This laser detector also includes a reversible clamp with bubble vial to ensure solid mounting to either rectangular or oval rods. With front and read LCD display, the LS100 provides clear visual readings. The three bright LEDs can be used as a reference for the receiver's position, while the grade information arrows show high, on-grade and low and breaks up the grade information into 11 different channels. This laser detector allows you to work with a fine, medium or coarse bandwidth. It also has a last beam strike memory and low battery indication. The LS100 receiver detects only the laser beam and ignores the flash from strong strobes on the jobsite for accurate results. With an IP67 rating, the LS100 is dustproof and water resistant. It works up to 70 hours using two AA alkaline batteries and features an automatic shutoff to conserve battery. This Agatec laser detector package comes with a rod clamp, batteries and 2-year warranty.